"Communicating the wonders of the past to the present"
13. 1. 2016 | Professor Pamela Robertson has spent her career studying the life and work of Glasgow's famous son Charles Rennie Mackintosh, an architect, designer and artist. She presents his achievements to the public through exhibitions, publications and public events programmes. Charles Rennie Mackintosh (1868–1928) is considered the most important British art noveau artist. Sometimes he worked with floral patterns, as was typical in this period, but he was also inspired by Japanese design and modernism. With these elements, he created his own unique style. He died impoverished in London in 1928. His contribution to the history of art and architecture has only been recognized after his death. Library of the Glasgow School of Art | (left) and watercolour 'Part Seen, Part Imagined', both by Charles R. Mackintosh. Some of his works became part of the famous 'Secession' exhibition in Vienna in 1900. AcademiaNet: You recently completed a major project funded by the UK Arts and Humanities Research Council on the architecture of Mackintosh. What new insights did this project generate? I think the research project was very valuable in that it enabled us to piece together the full spread of Mackintosh's career. We were able particularly to fill out the 1890s, when Mackintosh was an assistant in the practice of John Honeyman and Keppie, and to identify projects where his hand was evident but hadn't been recorded before. One of the goals of the project was also to put Mackintosh in context. So, for example, we documented all of the other projects that had gone through the practice during the Mackintosh years, so we could see what John Honeyman was doing, what John Keppie was doing, and we were able to plot who else was in the practice during those years. The project was able to give us a wider sense of what enabled Mackintosh's buildings to emerge. In many ways we realized this presented something of a microcosm of Glasgow, the great Victorian city. A key output of this project was an exhibition at the museum and art gallery The Hunterian, University of Glasgow. How did you go about translating this academic piece of work into an exhibition? One of the challenges was how to bring buildings into the exhibition. So we had a materials wall, where there were slabs of sandstone and other surfaces that an architect can use, to make the visitors think about physical buildings rather than just look at attractive drawings, and also films and models. We also had a section of the exhibition dealing with people. Architecture exhibitions can be quite anonymous, so we brought in stories about clients, contractors and colleagues, to show this broader network. Mackintosh exhibition in The Hunterian | in Glasgow. Not only the architect Charles Rennie Mackintosh was portrayed, but also his clients and colleagues. You've just recently retired from the post of Senior Curator at The Hunterian. What has been your favourite moment working there? That's hard to choose, but I can cite a recent one. We've just completed a refurbishment of The Mackintosh House, which is an integral part of the Hunterian Art Gallery and contains the reassembled interiors of Mackintosh's Glasgow home. The refurbishment involved taking out all of the contents, and having a thorough programme of painting, cleaning and repair. The rooms are lit by daylight, and during September we had some absolutely glorious weather. On my last day at work I was able to see the house reassembled, before the public was allowed back in, and had those rooms to myself for a final walkthrough while the daylight was streaming through. That was memorable. Kitting out The Mackintosh House for its first opening in 1981 was one of my very first tasks when I started at The Hunterian. So I suppose you could say things have come full circle. Mackintosh House drawing room | The Mackintosh House is part of The Hunterian. Interiors from Mackintosh's house in Glasgow are shown in this unique setting. This room shows inspirations from Japanese design and modernism, among other styles, to form the typical Mackintosh design. What made you decide to pursue a career in art galleries and museums, with a focus on exhibitions, rather than that of an academic art historian, focused on published outputs? I think I was motivated by wanting to communicate to the public. Coming out of my postgraduate course in Museum and Gallery Studies at the University of Manchester, I had a particular interest in the education side of museums and galleries. I had done some of my placement work during that course at the Geffreye Museum, London, which is specifically set up for education and school groups, and I just loved that. So it was about communicating the wonders of the past to the present. A number of your exhibitions have travelled to prestigious museums such as the Metropolitan Museum, New York. How does it feel to see something you've so painstakingly put together go on show on the other side of the world? It's terrific! It's a bit like a theatrical production. You may have written a script, but each different house or theatre presents it in a slightly different way. They'll take the content, but they'll have their own individual designers, they'll have different exhibition galleries, and they'll maybe emphasise different things for their audience. For example, the exhibition in the United States had to explain more about Glasgow. Prof. Pamela Robertson | studied history of art at University College in London, and has a postgraduate diploma in Art Gallery and Museum Studies from the University of Manchester. 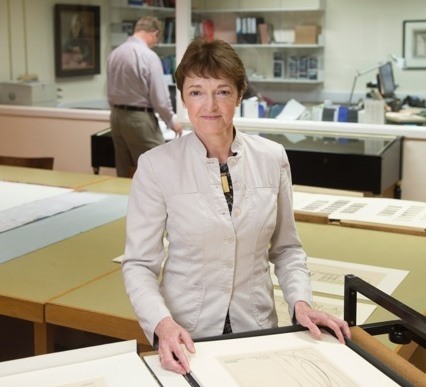 She has been Professor of Mackintosh Studies at the University of Glasgow since 2003, and for many years she also was Senior Curator at The Hunterian in Glasgow. Speaking of the US brings us nicely to your other key interest, the American-born artist James McNeill Whistler. Whistler is a quite different artist to Mackintosh, a painter of portraits and landscapes rather than a designer and craftsman. How does studying Whistler fit in with your interest in Mackintosh? Interestingly, there are more parallels than you might expect. They were both Victorian, they were both artists, painters and designers. They were both fastidious about colour harmonies and detail of that kind. And they were both progressive, pushing the boundaries, innovating. It is quite remarkable that the University of Glasgow, which didn't set out to have an art collection, has ownership of the estates of these two great figures, and that each constitutes the lead research collection anywhere. So Mackintosh and Whistler actually sit quite well side by side. You're planning to continue with research during retirement. What do you still want to achieve professionally? There are a couple of things I am interested in pursuing in terms of research. One is a long held interest in the patron and collector Fritz Waerndorfer who commissioned an extraordinary music room from Mackintosh and his wife Margaret Macdonald for his townhouse in Vienna. Waerndorfer is generally referred to as 'the banker' of what we call the Vienna Workshops. But there was more to him than that. So there’s a fascinating narrative to be developed alongside the bigger picture of Mackintosh and his engagement with the Continent. So I would like to follow through with that. Also, following the tragic fire at the Glasgow School of Art in 2014, there's a lot of focus on the Mackintosh building and bringing that back to life. The most celebrated interior in the School is the library. So I'm interested in looking at other architect-designed libraries of that period to put Mackintosh’s achievement into context. Dear Prof. Robertson, thank you very much for this interesting interview!